PAINTING WITHOUT FIRST SKETCHING in the subject is daunting to many artists. 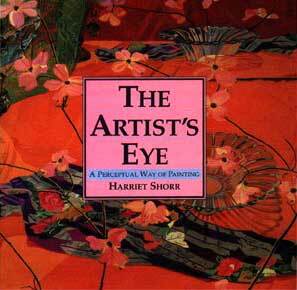 For Harriet Shorr, the basic elements of painting --- color, light, and shape --- are best expressed and executed free from preconception. She shows readers how to see their subject matter not as objects but as an assemblage of shapes, hues, and values --- a process that lies at the heart of all great art. Sumptuous and dynamic, the works in this collection have the expansiveness of Color Field paintings, but at the same time, they fall within the realm of realistic art. A piece to fruit, a bowl, a scarf, and other ordinary objects are often portrayed in unusually grand scale, particularly when seen through the unique and visionary eye of this artist. Consistent with the best tradition of fine-art books, THE ARTIST'S EYE offers a gallery of inspirational paintings. A delight to both the mind and the eye. Shorr's vibrant work will appeal to all artists searching for a way to express a personal vision. HARRIET SHORR, a professor of painting at the State University of New York at Purchase, has exhibited her work regularly in one-woman shows since 1972, both in New York and in other cities around the country, and has been in numerous group shows. She lives in New York City.